I’ve written before about how the main battery discharge record is one of my primary tools to determine what happened when a logger fails, but I thought I would try another kick at that can; delving into some of the things that show up on units that are apparently running OK, but still leave me scratching my head. These units buffered less than half a day of readings to the small 4K eeprom on the RTC breakout, so I attributed most of that 100 millivolt jitter to the frequent SD card writing. Some have pointed out that the internal voltage reading trick itself can suffer from as much as 10% variability from one processor to the next, with additional thermal variations. But at least those curves were predictable, with a 6 cell (2x3AA) pack lasting longer than the four months between fieldwork trips. As you see the depth and duration of the dips vary somewhat, although the amount of data being written is always exactly the same, which makes me wonder about random latency delays. And that curve also has a mysterious low voltage anomaly showing up around 9/20 that lasted for the better part of a week. I see stuff like that in about 15% of the loggers that give no other sign of problems, have low sleep currents, and decent operating lifespans. And this is definitely not temperature related, since most of the cave loggers see less than 1°C variation over a deployment. The timing of these long gap events can be regular, as shown above, or more variable. My current hypothesis is that some threshold is being passed inside the SD card controller triggering some kind of huge load balancing event that hits the battery with a sustained power draw much larger than any of the normal logger operations. This makes me wonder if the battery packs would benefit from a parallel supercap to buffer those pulsed loads. 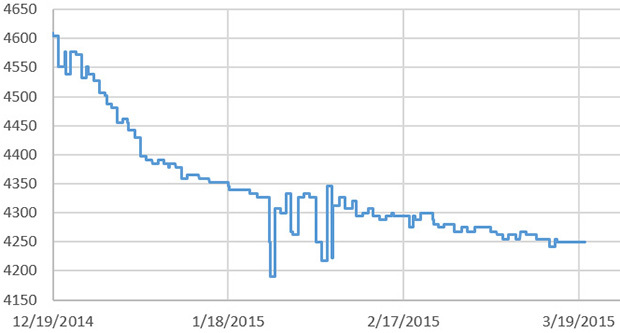 I suspect that the SD cards are responsible for most of the power curve anomalies that I’m seeing. All the loggers are now using Sandisk’s MUVE music SD cards that quickly go into low current sleep, so I am still left wondering what the real cause is. Anyway, I’d love to hear comments from others who have seen curves like this in ‘otherwise normal’ equipment. This unit was taking a sample every 5 minutes, and with only 20 readings buffered to the eeprom those numerous 100mV spikes are from the frequent SD write events. This was a continuous run, so the code did not change even though there was a fairly dramatic shift of the pattern in the voltage readings. 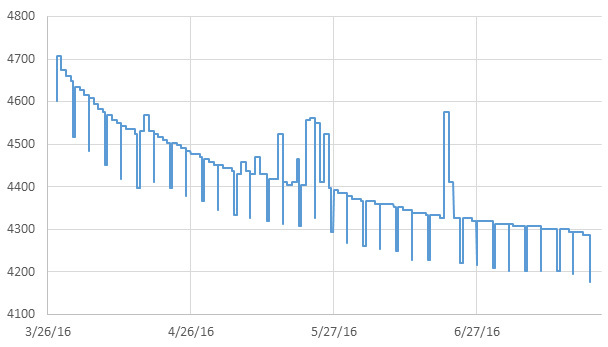 Usually I see this kind of thing in reverse when a sensor fails (ie: a smoother curve becoming more and more variable as the sensor goes down). I have no idea what caused this unit to become more regular as the run progressed? I monitor the main AA supply with a simple 2 x 4.7MΩ divider on an analog pin, but Dangerous Prototypes spotted a low voltage indicator circuit that can be built from a couple of comparators. This could come in handy for builds that don’t have enough pins left to keep track of Vbat. This would be handy for minimal builds with AT Tiny’s. 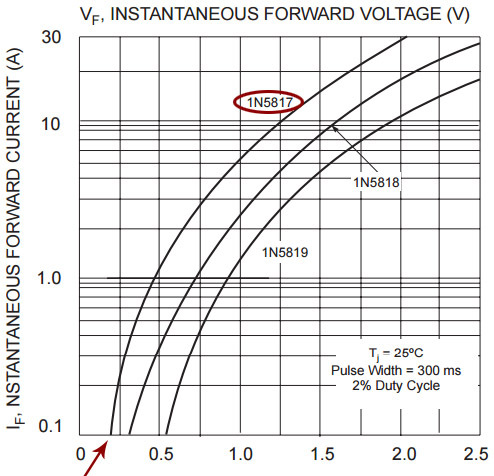 There is also some interesting background info on battery discharge curves with boost converter in this TI appnote. This is a bit of a tangent, but I’ve been using bog standard 40v 1A Shottky 1N5819 diodes to isolate the 3xAA battery banks on some of my loggers, and I just noticed in the datasheet that 20v 1N5817’s have about 1/2 the Vf. 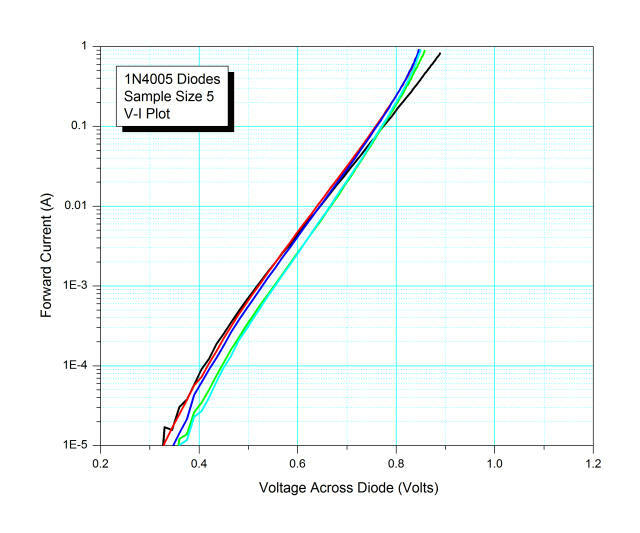 And I just found out that with beefier 3A diodes, I can probably bring the voltage drop even lower during SD card write events, which could push the logger below the 0.1 A line at the bottom of this graph. This makes me wonder how much of the voltage dips I’ve been seeing are a real effect of the load on the battery, and how much is simply an artifact of the isolation diodes? Continuing on the diode tangent, I’ve recently come across a few mentions of powering Arduino projects with 4xAA batteries in series, using a 1N4001 diode to drop the voltage into the 5.5v range you see on some 3.3v Arduino regulators. I have yet to find any tests of exactly how much power you would be wasting over the diode, vs the extra power you could extract by taking 4 cells down to about 0.85v than you could with 3 cells in series (~1.16v) . The circuit would cause a voltage fluctuation of about 0.2 volts but I don’t know if that is worse than the Shottkys, as their datasheet does not go down to very low current levels. It’s worth noting that the MIC5205 on the ProMini is rated to 12v input but that comes at the cost of another 0.05mA sleep current which would burn away the benefit of that extra cell fairly quickly. 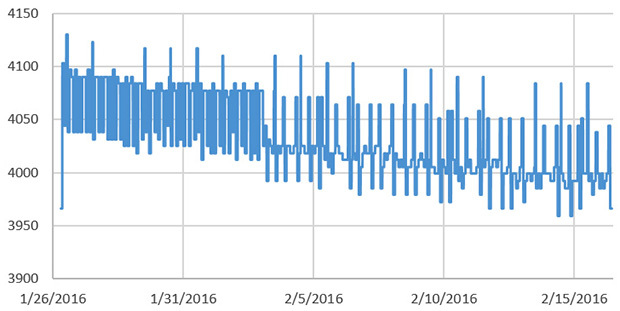 This entry was posted in Reducing power consumption, Test results & Data analysis on January 20, 2016 by edmallon.